Route Optimization software connecting your constraints, optimizing your resources and enhancing customer relations. The innovative and all-in-one solutions for the Operations Managers planning and organizing pick-up, delivery and multi-stop routes. The global integrator of communications services offers our solutions to professional customers. Orange Business Services choose Antsway as we offer the most innovative and reliable route optimization software on the market for any business that makes deliveries, pick-ups and multi-stop routes. Save operating costs, improve deliverymen and technicians’ experience and meet your customers’ expectations by considering 25+ constraints about vehicles, agents and customers. Consider customers’ expectations and offer quality services. Enhance customer satisfaction and improve drivers’ productivity. Plan routes easily and stress-free and reduce delivering costs. Optimize delivery route planning and reduce operating costs. Make the route planning easier and reduce operating costs. Schedule appointments easily and meet commitments from the first visit. Manage planning stress-free and improve care of each patient. Meet the scheduled date and time slot and keep operating costs down. AntsRoute is the first and fastest software connecting constraints of your resources (vehicles, drivers, profitability, organization) to external expectations (customers, punctuality, delivery locations, predefined pick-ups and multi-stop routes, unexpected situations or traffic jam). How to plan the best routes in seconds with our dynamic route planner? Optimize your resources with AntsRoute! 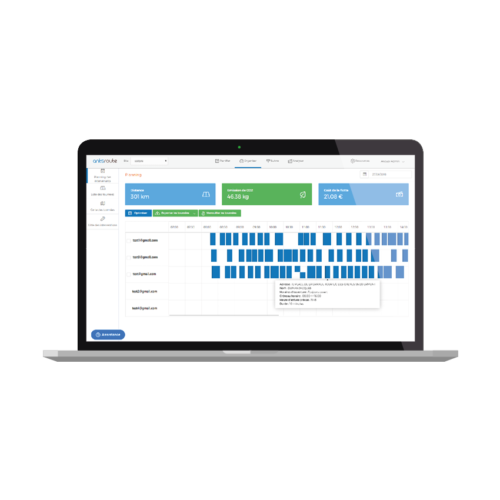 Discover the features of our easy-to-use software and start to define optimal daily route plans for your technicians and deliverymen. Our intuitive software helps you to schedule your appointments. AntsRoute chooses several dates according to your customers’ requirements (time windows, stop duration), vehicles (types, capacities, etc.) and deliverymen or technicians (working hours, availabilities, lunch breaks, skills, authorizations). The innovative software setup routes with multiple stops instantly and avoiding hours of manual planning. It helps to reduce travelling time and operating costs. The technicians & deliverymen’s schedules are made considering internal constraints, customers’ expectations and drive objectives of each vehicle. AntsRoute enables Managers to track deliveries and pick-ups in real time thanks to the route optimization mobile app. Drivers are able to conduct their routes, prevent and counter the unforeseen events. 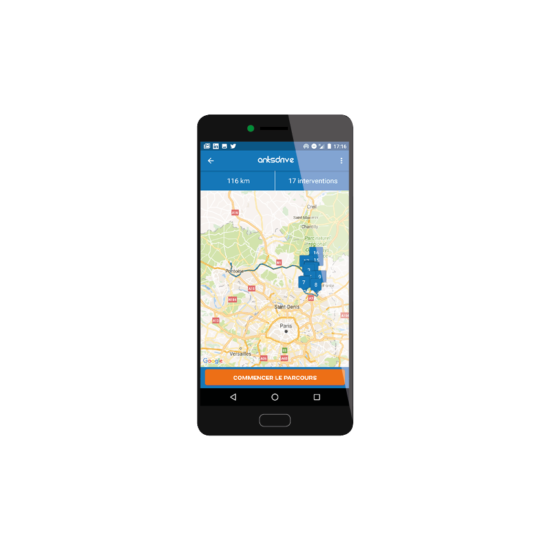 The easy-to-use route optimization mobile app AntsDrive offers an optimal organization on the ground thanks to a real-time resequencing of orders and various kinds of alert notifications. AntsRoute gives Managers access to data and performance indicators. The route optimization software makes available a comparative report between scheduled routes and done ones. AntsDrive is an easy-to-use mobile app connected to the route optimization software AntsRoute. It’s used by deliverymen and technicians to conduct their daily routes. The route optimization mobile app gives drivers access to route plan and information regarding customers. The organization is optimal with AntsDrive! You can reoptimize routes in real time considering all constraints about customers when your drivers encounter unexpected situations (traffic jam, delays, absence). Start using the easiest & fastest route optimization software! AntsRoute is an intuitive and easy-to-use Route Optimization software. Plan & optimize your delivery, pick-up and multiple stops routes, track in real-time your drivers. AntsRoute connects your internal & external constraints and enhance customer relation.